The Chairman of the Pedestrian Council of Australia, Mr Harold Scruby, in response to Minister Carl Scully's announcement (copy of transcript) in Parliament today said: " We welcome the Minister's initiatives, but they are no where near enough. In February 1999, we published a letter in the SMH (copy below). It stated the obvious. Had the authorities taken notice of this letter then , we may have avoided the Ella James tragedy in Bulli. "Below is a copy of the PCA's 7-Point Plan sent to Mr Scully on 28 June 2000 . Our recommendations are elementary. How many more Ella James will there be, before the STAYSAFE Report is even considered? The Pedestrian death toll is now 80 - 7 greater than last year. Mr Scruby added: "You only have to look at the photos below to realise that the entire School Zone system is in a diabolical mess. There are differing times and speeds all over the state. How are pedestrians and motorists going to remember and be constantly aware of all these variations? Pedestrians/schoolchildren can't even see the times from where they usually cross the road. "We want uniformity and consistency (7 to 5 - Ensure they survive). And we want every school in NSW surrounded by a 40 km/h all-day speed zone, with rumble grids, speed cameras and red-light cameras. And 3 demerit points for those motorists selfish or stupid enough to STOP in pedestrian zones. "Clearly, if the authorities can permit a 40 km/h zone ALL-DAY in Mosman, they can permit the same ACROSS the state, around EVERY school, main road or back street. No more inquiries. We want ACTION and we want it NOW." There is no requirement for vehicles travelling towards school buses to slow down to 40 km/h, leaving children to face vehicles in 60 km/k-plus zones on the opposite side of the road. There is no standard warning period required giving motorists reasonable time to slow down. The minimum penalty is only one demerit point where there are three demerit points for failing to fasten your seat belt. In NSW, there is automatic loss of licence for exceeding the speed limit by 30 km/h, yet strangely, this does not apply for speeding past a school bus. And effective enforcement is likely to be extremely difficult, unless for example, speed cameras are fixed to buses. Without exception, all schools should be surrounded by 40 km/h zones. They�re not, and the authorities rarely permit them on main roads where they are most needed. Additionally, these zones should apply all day, not just in the mornings and afternoons. Children go to sport on excursions, to the shops, libraries and home sick at all hours of the day. The greatest absurdity exists in the bush. Most school zones in rural areas are 60 km/h. Why? Are their lives and safety less important, particularly when RTA literature states �around schools 60 km/h is far too fast�. Our children are our greatest asset. They deserve the best protection we can give them. These laws, their administration and enforcement are in urgent need of review and correction. 1 Ensure ALL schools in NSW are IMMEDIATELY surrounded by a 40 km/h speed zone. 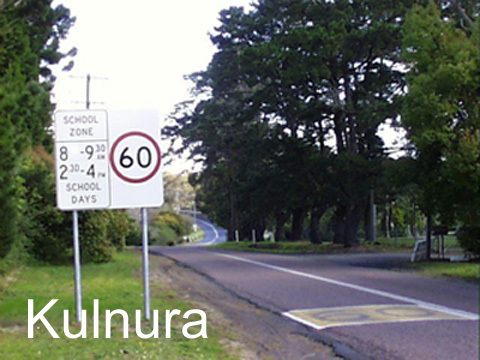 2 Immediately change ALL 60 km/h school zones in rural areas (and elsewhere if applicable) to 40 km/h (see attached photos of school zones and just compare the signage at Kulnura, Broulee and Kurrajong. All different speeds and times. The RTA's own literature states that around schools 60 km/h is far too fast. These confusing anomalies can not be allowed to remain any longer and are able to be remedied swiftly and without much cost..
3 Install fixed Speed Cameras and Red Light Cameras at all these locations. Apart from being self-funding, particularly with the new digital technology, the evidence is overwhelming that these devices dramatically reduce speed and the running of red lights. 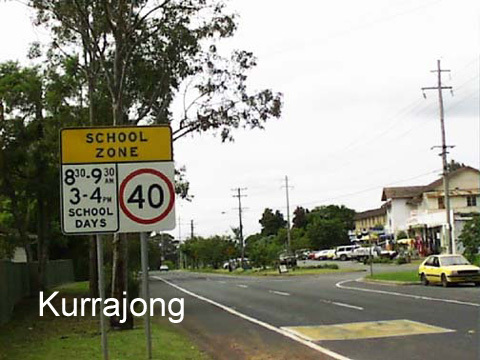 4 Standardise all school zone times throughout NSW. These times are difficult enough for motorists to remember without varying them throughout the state (see attached photos). And then consider making a standard time of 7:00 AM to 5:00 PM on ALL school days. Not only would this be much easier for all concerned to remember, but children come and go to school at all hours of the day for reasons such as sport, sickness, excursions etc.. A catchy slogan could then accompany all advertising campaigns ... e.g. 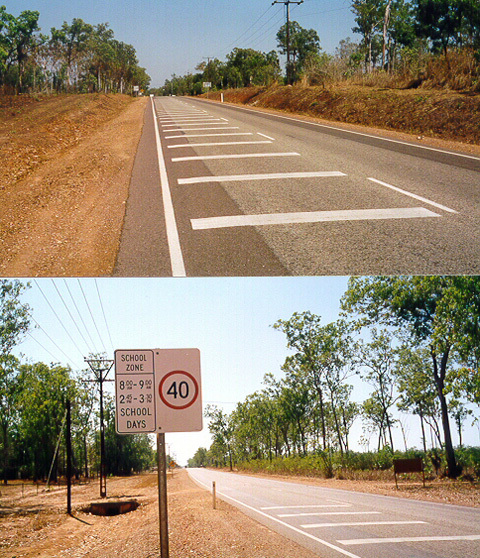 "7 to 5 - Ensure they survive"
5 Consider either installing rumble-grids such as those depicted in the photo (below) taken in the Northern Territory (please note that although their speed limit is de-restricted in rural areas, their school zones are still 40 km/h) or installing solar-powered flashing orange lights on all school zone signage to be activated in school zone times. 6 Implement the three demerit points for vehicles stopping in ALL pedestrian crossings, but particularly school zones. This law is widely flouted, frequently by owners of large 4WDs. They obstruct the vision of both pedestrians and other drivers. We have the written support of the NRMA (see copy below) for this initiative. The LGA is also supportive according to the recent attached Telegraph report of 27 Jan 2000 (quote): "Parking offenders should be hit with higher fines and docked licence points under a submission from NSW councils." We note your letter of 4 July 1997 and the RTA's IDC also supported this initiative three years ago. We congratulate you for increasing the penalty for this offence to over $200, but it will be the demerit points which will change driver-behaviour. After all, it's 3 demerit points for not fastening one's seat-belt, where no-one but the perpetrator's safety is compromised. 7 A statewide awareness and education campaign. At a recent meeting of NRMA�s Public Policy Review Committee the issue of demerit points being applied to �no stopping� offences was discussed. The committee considered the application of demerit points to the offences of stopping in pedestrian, bus, and �no stopping� zones, and double-parking. The purpose of this letter is to inform you of the Committee�s decision which, pending ratification at Board level, will become NRMA�s policy position. The Committee resolved to support the introduction of 3 demerit points for stopping on pedestrian crossings, and the need for more road user education about �no stopping� zones. The Committee did not support the application of demerit points to the other offences discussed, but indicated that this could be reconsidered in the future following appropriate road user education. The Committee also resolved that, whenever possible, infringement notices for demerit points should be presented directly to the driver. A further resolution was passed that NRMA lobby the RTA to provide designated and reserved areas in appropriate locations for special needs vehicles such as Armourgard vehicles. If you would like to discuss this issue or seek further clarification please feel free to call me on 9292-9588 or Stephen Gray, Manager, Road Safety on 9292-8251. Mr McBRIDE (CHAIRMAN): The STAYSAFE Committee welcomes the representative of the Pedestrian Council of Australia, Harold Scruby, who will testify on matters relating to traffic control and safety around schools. Thank you for your appearance today. The committee has received a submission from you. I direct this correspondence to be tabled at this time. Do you wish this correspondence to form part of your evidence here today? Mr McBRIDE (CHAIRMAN): I am advised that you have been issued with a copy of the STAYSAFE Committee's terms of reference and also a copy of the Legislative Assembly's standing orders 332, 333 and 334, which relate to the examination of witnesses. Is that correct? Mr McBRIDE (CHAIRMAN): Did you receive a summons issued under my hand in accordance with the provisions of the Parliamentary Evidence Act 1901 requiring you to attend before this Committee? Mr McBRIDE (CHAIRMAN): I draw your attention to the fact that the evidence you shall give is privileged and you are protected from any legal or administrative action that might otherwise have been able to have been taken with regard to your evidence. Do wish to table any further documents relating to the matters under an examination in this hearing at this time? Mr SCRUBY: I will as I proceed if that is okay with you, Mr Chairman. Perhaps I should start by saying that we had three deaths over Easter, which was most commendable. We had eight last weekend and six yesterday. To put things in perspective, things have not improved much. We had a wonderful Easter with a terrific campaign and lots of effort towards demerit points. In the piece you just saw from A Current Affair there was a very important issue. It was to do with a case three years ago before the Court of Appeal called Lolomania v Rush. The lady from the Roads and Traffic Authority said, "Around areas like this in a curve no motorist could be expected to slow down". One of the most important things I could ask of this Committee is to get out to people, including people at the Roads and Traffic Authority, that that is not the case. Lolomania says categorically that the presence of young children on or near the road calls for the exercise of greater care and caution than usual by a reasonably prudent driver. This Court Of Appeal decision found that the defendant was negligent in failing to moderate or adjust her driving in order to ensure that she could deal with the possible risk of tragedy if there was a child hidden by the van who suddenly came onto the road. In other words, in an area such as that where there is a school zone and where there are children around the Court Of Appeal has found unequivocally that it is not a matter of no motorist reasonably being expected to slow down; a motorist has to slow down and it is incumbent upon a motorist to slow down and not to collide with or crash into children. I will table the judgment. It is an important document. I believe you have seen our seven point plan. Mr Chairman, I will precis the points. We would like a 40 kilometre per hour zone at every school in New South Wales unless you can put in overhead bridges and fences to stop children crossing at those points. Secondly, we would like all 60 kilometre an hour zones in the bush to become 40 kilometre an hour zones. It is utterly outrageous. You will see some of our letters to the newspapers going back two years arguing that there should be no such thing as a 60 kilometre an hour zone for any child in this State. That children in the bush have to try to get across the road more quickly than children in the city is ludicrous. Mr McBRIDE (CHAIRMAN): You mean 60 kilometre an hour zones around schools? Mr CAMPBELL (STAYSAFE): Where it is an 80 zone it drops to 60. The 40 zones are usually inside 60 zones. But where the speed limit on a country road is 80 it drops to only 60. Mr SCRUBY: Yes. 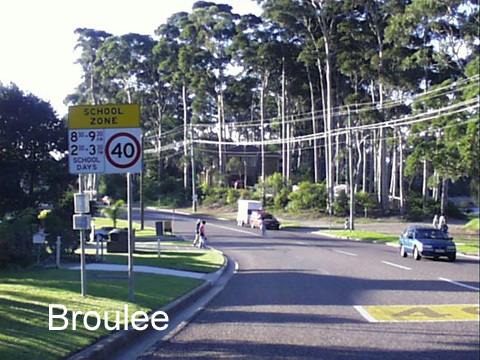 On 10 March 2000, three months before the tragic death in Bulli, I was arguing that speed zones should be dropped to 40. Craig Moran of the Roads and Traffic Authority gave a detailed explanation why not all speed limits outside schools are 40 zones. Mr Moran explained that in rural areas where the speed is 100 kilometres an hour it would not be possible to drop the speed to 40 kilometres an hour: the drop from 100 to 40 is much to much; 60 is a more reasonable drop. No child should be asked to cross any road where the vehicles are going past at 60. In the Roads and Traffic Authority's own literature it states that around schools, hospitals and other areas 60 is far too fast. It is unacceptable. That is the second document I wish to table. My third point relates to times. The times are all over the place. Outside Queenwood in Mosman it is 7 to 3. Outside Middle Harbour school I think it is 8.30 to 9.30 and then 2.30 to 4, and it applies on school days. Does anyone here know whether the Catholic schools, the independent schools or the public schools have gone back yet? Mr GREENE (STAYSAFE): Next Tuesday. Staff development day is on Monday. That is why they are not there. Mr CAMPBELL (STAYSAFE): This morning the Teachers Federation put that it should be 24 hours a day. Mr SCRUBY: Politicians have to try to achieve the possible, not the impossible. I do not think that that is politically possible. As much as I would like to see rumble grids outside schools, as there are in the Northern Territory, rumble grids make a hell of a noise in residential areas. Having chaired a local government committee for five years I know that there would be a community backlash because semitrailers going over a rumble grid at 11 o'clock at night would make it difficult to sleep. But flashing orange lights from 7 to 5�not at weekends, on Anzac Day or Easter�when schools are operating would be a terrific encouragement for people to know that they are in a school zone. Mr GREENE (STAYSAFE): The Catholic Education Commission said in its submission that that did not work. Mr SCRUBY: How would they know when we have never done it? Mr GREENE (STAYSAFE): They said they had University of New England research�I think I am quoting the correct research�saying that it was ineffective. Mr SCRUBY: I can give you research showing that the Challenger would not crash too. I do not accept that. Mr GREENE (STAYSAFE): I am not agreeing or disagreeing; I am putting it from our perspective. Mr West is not here but he made the comment at the time that he�I am sure others around the table thought the same thing�thought they were a pretty good idea. Mr SCRUBY: Some people call them Laurie's lights because Laurie Brereton shoved them up the Hawkesbury River. They have worked very well. They are an idea. This thing will not progress without ideas. I can only throw them to the Committee to see whether it is interested. There are some anomalies here that you will be very interested in that could be corrected overnight. You will be disgusted by them. We are saying that all schools zones throughout New South Wales should be standardised. We are saying that fixed speed cameras and red light cameras should be installed. One of the main problems with fixed speed cameras and red light cameras, as you all know, is that the revenue from the fines goes back to consolidated revenue. Treasury gets its hands on it and no-one sees it again. These things could all be self-funding. You saw the car go through the red light. There is a gentleman here today who can tell you what happens when cars go through red lights. We on Mosman council offered to pay for a red light camera but we were not allowed because we did not meet the warrants. It took me five years�you have got a picture of the thing in 1995�just to get in the first 40 kilometre an hour zone on a main road. It is only just now starting to be enforced. That is how long it has taken. A red light camera in these areas is so fundamentally important. They are not that expensive. The technology is getting cheaper and cheaper. The fines should go back to paying for the red light camera instead of whatever goes into Treasury. If you could refer this to the Auditor-General he would come back with a very good report for you. I think it is all accounted for the wrong way. Fixed speed cameras and red light cameras are all self-funding. I have changed my mind on rumble grids: I do not think they will work in residential areas. They are probably very good in the bush but not in residential areas. We should implement three demerit points for vehicles stopping in all pedestrian crossings. In our view demerit points are one of the best devices governments ever invented for changing driver behaviour. Look what happened over Easter. We know we had good weather but there were three deaths and we went berserk on double demerit points. People got six demerit points for not doing up a seat belt. The Sydney Morning Herald�I will tell you where it got this�gave nine things a motorist could do this weekend without one demerit point: fail to give way to an ambulance, drive up Pitt Street the wrong way, overtake a bus in a no overtaking bus zone, jump out of a moving vehicle, drive along a footpath, watch television while at the wheel, conduct an aggravated burnout, drive without being in proper control and put the kids in a box trailer and tow them to the border. It did not say that you can also use mobile phone, drive unlicensed, unregistered and an insured. But the most important thing, a real farce, is that there is not one demerit point for carrying a radar detecting device. There are high fines�a thousand bucks�but if you are rich, who cares? If you are on 10 points what is better? Trust me, a lot of people are carrying radar detecting devices. There is not one demerit point for it. If you are rich you can drive ride around Sydney now without getting one speeding fine. Please Committee, if you can do one thing, please send the whole demerit points system off to a separate review outside of government. Get someone to review the demerit points system. It is absolutely archaic. They took demerit points off negligent driving. You do not get one demerit point for negligent driving. How many crook drivers are driving around Sydney now with no points on their licence just because they do not speed? Speeding is only one element of bad driving. I would like to table two more letters, one from Mr Scully going back to 1997 when we pushed the idea of demerit points. He wrote that the Roads and Traffic Authority interdepartmental committee on traffic penalties supported in principle the allocation of demerit points for vehicles parked on marked foot crossings. The allocation of demerit point associated with this activity was then being pursued. Nothing has happened. The NRMA has backed us. You could not get anything better than a motoring organisation backing us. In September 1998 an NRMA committee resolved to support the introduction of three demerit points for stopping on pedestrian crossings. Terrific stuff. If you have got the NRMA behind you, what is the problem? If you want to see some classic bungling, leaving aside demerit points for the moment, does anyone know what the current penalty is for stopping in a pedestrian crossing? Mr McBRIDE (CHAIRMAN): Tell us. Australian road rule 332 sets out that parking control sign applies to a length of road, that is, from sign to sign and hence takes precedence over the statutory provision. Can you believe this? Mr Chairman, I implore you, you have enough muscle. Get this changed and fixed�if not demerit points, at least a fine of $206 for parking. Let me add to Ms Whalan. I will table her letter, which is a damn good letter, from the New South Wales Police Service. Another anomaly� and this is outside the very school where we were, which you saw on TV, where the police were booking people going through the school zone at speed�a delivery truck comes along and parks right in the middle of the footpath so that not a kid can get by at the lights. I said to the police officer, "Would you mind just going up?" He said, "Mate, he's doing a job." This picture gives you a concept of dangerous parking. This is two days before Walk Safely to School Day. 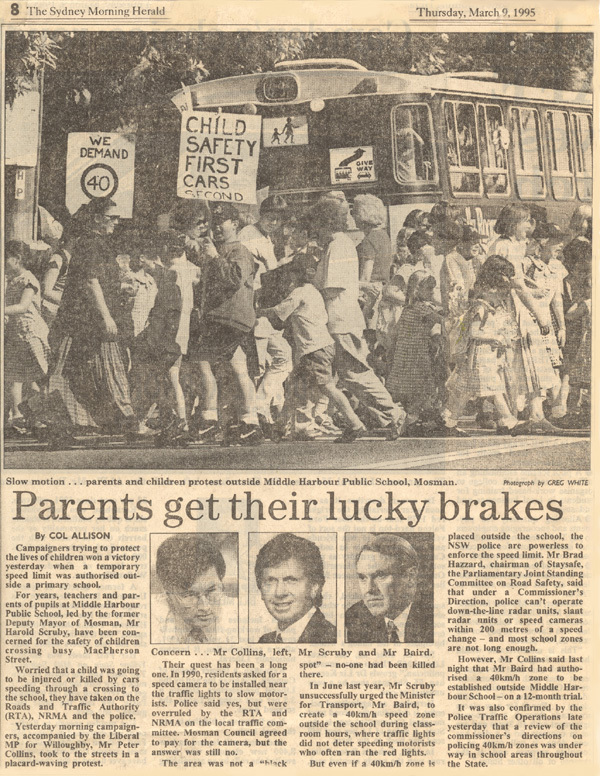 The picture shows all the kids in Balmain walking along the road to school because the cars are on the footpath. Why are they on the footpath? Here is another picture of a kid going to school who is having to walk on the road. Why does he walk on the road? Why are the old people in this picture holding onto each other when they are just about to get hit by a taxi? The penalty for parking on a footpath is $62. Currently we have no authority to arrange for a tow of vehicles which park on footpaths. It is my opinion that the penalty for this offence should carry a greater penalty than $62 and that a proposal be put forward to increase the penalty from $62 to $206 in line with the offence for stop or no stop near pedestrian crossing. As much as the parking police enforce this offence, it has little impact on the motorist as the offence carries such a low penalty of $62. It is a fine of $54 now to park in the city all day in the building in which you all work. Yet it is $63 to park outside Myer on the footpath, and no-one can tow you away. We have to have a look at these penalties and bring some justice, equity, fairness and some sort of relativity. It is a fine of $62 for being five minutes over on a meter and $62 for being in the middle of George Street on a footpath all day. It is a fine of $348 for defacing a coupon. What has happened�and everyone knows it�is that all these things are done piecemeal. If someone screams to "Fix that", everything else goes into disarray. It is a fine of $1,500 on the spot for pouring paint down the gutter, but it is $62 for parking on the footpath in George Street all day and blocking the entire footpath. If anyone has any questions I would be happy to try to answer them. Mr BARTLETT (STAYSAFE): Your excellent submission includes many things that I did not know. Mr SCRUBY: I implore you, gentleman, you are the people who represent us. You have the ability to change things. There is nothing more important in road safety than a children's school zone. The members around the table must have about 30 children. I implore you to write to Mr Scully or the Premier and get behind the demerit points. They are a terrific way of getting driver behaviour changed. Every taxi driver in this city believes that a pedestrian crossing is a taxi zone. Taxi drivers would not behave like that if they faced three demerit points, I can promise you. I would rather see the fines knocked back to $10 and some reasonable demerit points put in place. Then you would see some genuine driver behaviour changes. I thank you for hearing me. Mr McBRIDE (CHAIRMAN): Thank you, you are always entertaining and to the point.